Paul's brief letter to Timothy about how to be a pastor in community stays right on point. In chapter 1, Paul encouraged Timothy to preach Jesus and practice the gospel. He reminds him of the importance of prayer and unity in chapter 2. In the last chapter, he describes the qualifications for elders, the teachers in community, and deacons, the practical organizers. It is through these people that good teaching will be given and practiced, and by their teaching and example that unity will be maintained. For both, he places character and integrity far above gifting or personal power. Here in the fourth chapter, Paul returns to the importance of good teaching as he established in the first chapter. The chapter follows a doxology, or poetic statement of faith from the end of the third chapter. In this doxology Paul again confronts the common heterodoxy of gnosticism that plagued the early church. Gnostics believed that all matter was evil, and therefore denied that Jesus had a physical body, or had "come in the flesh". This led to a practice of withdrawing themselves from the world, making their communities ineffective and inwardly focussed. The church of Jesus was called to redeem the world, not escape it. This made the doctrine of Jesus "coming in the flesh" essential to the early church's gospel teaching. Paul follows this by warning Timothy of false teachers in the church that would pervert the truth of God's grace by requiring rituals and customs for people to be part of Kingdom communities. The good news of Jesus was that it was offered to everyone, everywhere, with no entrance requirement. Jesus' gift was offered once for all. We do not need to change how we eat, dress, or talk to remain in God's good grace. It's all free, and it's all freedom. Paul calls any other teaching a "doctrine of demons". For everything created by God is good, and nothing is to be rejected if it is received with thanksgiving, 5 for it is made holy by the word of God and prayer. 7 Have nothing to do with irreverent, silly myths. 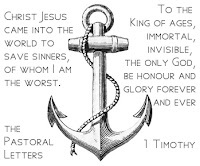 Timothy is encouraged instead to practice godliness, which is not by the law or ritual but through faith in Jesus. For to this end we toil and strive, because we have our hope set on the living God, who is the Saviour of all people, especially of those who believe. Paul reminds Timothy again to teach and serve from the gift of the Holy Spirit within him. It is not by his own strength or power, but through the strength of God in him that he is able to pastor. In the Spirit, he should faithfully and consistently point the congregation back to scripture. He is an example to the church of the gospel by his conduct. This is his job as a pastor. The chapter concludes by encouraging Timothy that he, too, receives the benefit of his teaching ministry. Pastors bless people as they teach, and are blessed to teach.